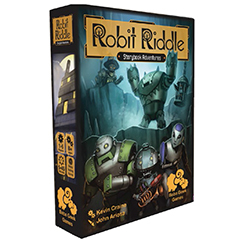 From Designer Kevin Craine and Artist John Ariosa (Mice & Mystics) comes Robit Riddle where players make believe they are robots trying to find their missing pet robits. They will work together choosing their path through the story, having encounters, finding friends and adventuring along the way. 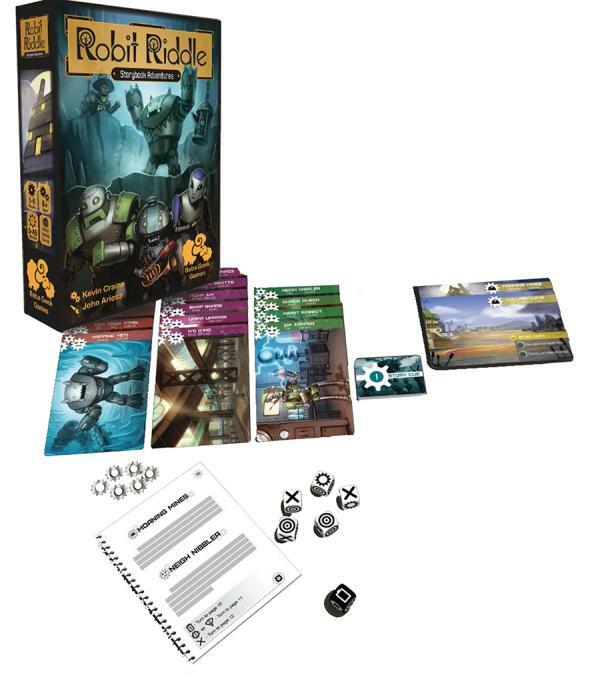 Following a successful crowdfunding campaign by Baba Geek Games, Atlas Games is pleased to offer this beautiful and innovative game to the hobby game trade. �	Easy to learn and quick to play. �	Introduction to role playing with no GM. �	3 family friendly storybooks with 50+ endings. �	Jumbo cards for award winning artwork. �	Players choose a character, then follow along in one of three storybooks. As encounters arise, players decide how their characters will approach the situation. They tell a little story and then roll the dice. �	Teammates can help out by spending story tokens and telling stories. The outcome determines the direction of the story. Both success and failure can continue the story forward, but in different directions.